The sun rose and as its light reflected across the surface of the sea a dark shape could be seen far out in the bay. It was moving towards the city and the sea around it swirled and sprayed from its passage. As it drew towards the shallows a great wave formed before it. Plumes of water higher than the tallest masts in the harbour shot upwards from the rocks on the coast. The dark shape rose higher and more of its vast bulk became visible above the waves. Too late the watchmen ran from the docks to ring the bells and wake the sleepers. Too late the boats weighed anchor and tried to escape. Too late the knights ran to the beach, their bright swords drawn, banners snapping in the wind. The roar of the city’s fall was heard in villages two hours inland. The three fanged mouths of the beast tore at buildings and spat sand and weed over all. The water rushed, unstoppable, through the streets. Men, women and children were swept up and pulled under. Masonry crumbled. There were some amongst the knights, those of the higher orders, who were more than just soldiers. They drew upon ancient powers and secret knowledge and bravely fought the beast. By the time the sun had fully risen they had slain it, but only three still stood. The city they had fought to defend was gone. 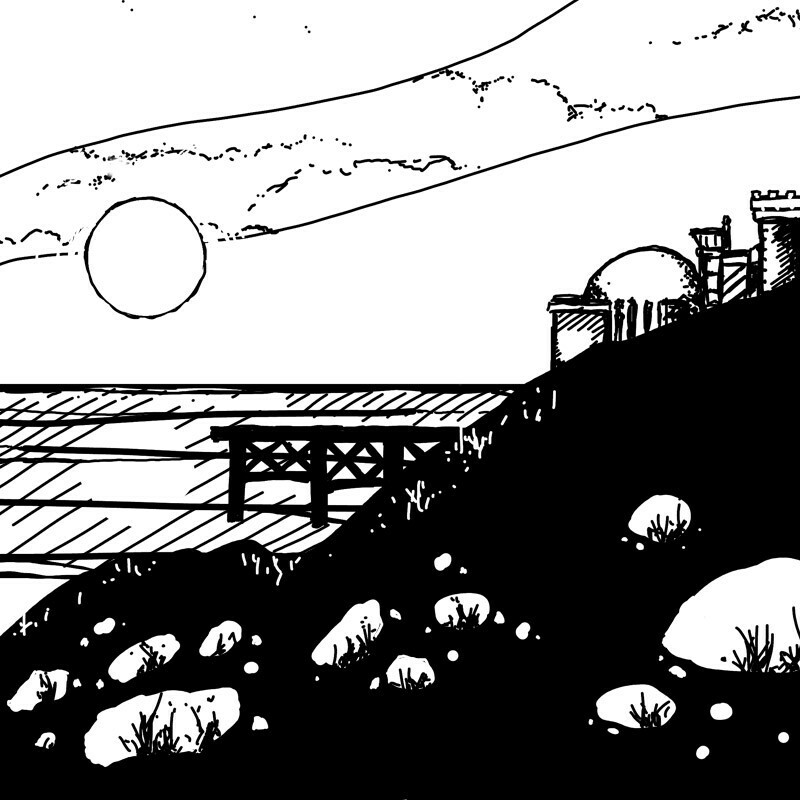 The city of Pharenis is a major port standing on the Western coast of Llaewar. During the early part of the Age of Exploration it was discovered by migrating Garun Dashi, who began to take control of the city. The priesthood of the ocean, seeing the city gradually fall to their control, called the Tide With Three Mouths to destroy it. They succeeded, but tragically the knights of Pharenis stood in defence of the city and were also all but destroyed. The city was rebuilt as a shanty town around the ruins. In this state it was discovered by the Order of Cartographer Adepts. The explorer and trader Carlo Mendez coordinated the rebuilding over the city over the following decade and continued to live there himself even following his marriage to Acuity Snow Irgan. This connection to the Lossanbrant’s ruling council left Pharenis, politically speaking, as a province of the Lossanbrant. However, strong alliances with Gobal Palace, Relgen Tower and Ulanquin meant that Llaewar nonetheless functioned more or less as a nation. Pharenis is very much a trade city. Being further North along the coast than Sunset Market it is well placed to trade with the Seats of Urthauld as well as the Lossanbrant and in the later years of the Age of Exploration was the principal port from which voyages to the Northern Ocean departed. The knights of Pharenis died out at around the time of the city’s reconstruction, but the priesthood of the ocean survived. Because of their role in destroying the city they remained forever in hiding thereafter, but the more educated amongst the people of Pharenis knew them to be a force for good. Businesses within the city would often discreetly display a small symbol, which meant a member of the priesthood could be contacted by asking the staff there. Indeed, it would often turn out to be the proprietor once whoever was enquiring had proven themselves to be friendly.